In 1864, millionaire Ben "Doc" Holladay bought up almost 1,000 acres in Purchase, predominantly from members of the Haviland family. He did it to satisfy his wife, Ann Calvert, a well-bred gentlewoman who had married Ben over her parents' objections. They had lived in San Francisco, Oregon and Washington D.C., but Ann wanted to join the New York social scene. Ben built her a magnificent six-story, 100-room mansion and called it Ophir Farm after a Nevada mine he won in a poker game. The mansion (whose footprint is the foundation of present-day Reid Castle) was admired throughout the state. Holladay also built 18 farm buildings including a coach house, stables and a private chapel. A devout Roman Catholic, Ann asked her husband to build her a chapel. She often spent time in the Norman Gothic-style chapel Ben had built just for her. Private family chapels are rare, and the Holladay chapel represents the oldest of three in Westchester County. Ann had a boulder with a carved cross and heart in the center placed on the estate's entrance drive so people would know "Catholics lived here." The boulder has since been moved and is now located near the chapel. Ben Holladay lost his fortune in the New York Stock Market crash of 1873, the very day Ann died, and he declared bankruptcy shortly thereafter. A huge financial burden, his mansion was put up for public sale. Ann and their three children were buried in the vault under the chapel, but in 1919 were moved to a vault built by one the estate's successive owners Mrs. Whitelaw Reid in St. Mary's Catholic Cemetery in Port Chester, N.Y. The Chapel was then neglected for many years. Trees and brush obscured it from view, and in the 1970's its slate roof collapsed. It was all but forgotten, until Michaela Walsh, Manhattanville's director of women and leadership, decided to get involved. Her vision led to restoration of the Chapel and the development of the Environmental Park that surrounds it. She was assisted by Biology Professor Nancy Todd who has worked on developing curricula that will elevate environmental studies from a minor to a major. 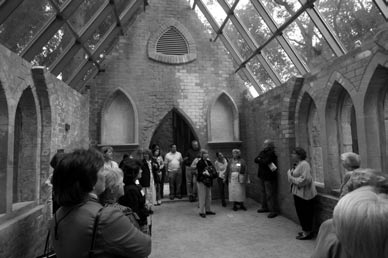 Walsh convinced Maya Lin to lead the restoration and today the Manhattanville College Environmental Park provides a learning space for educating Manhattanville College students, faculty, staff and members of the surrounding community who wish to develop ecologically sustainable ways to preserve the past, present and future. The Ohnell Environmental Park represents a commitment to preserving a historically important part of the Manhattanville College campus and community. Manhattanville and the Purchase Environmental Protective Association (PEPA) worked together to preserve some of Ophir Farm Estate's other historic structures and cultural landscape, much of it co-located on the college campus.